The Thrift Store Swap - Happily Ever After, Etc. 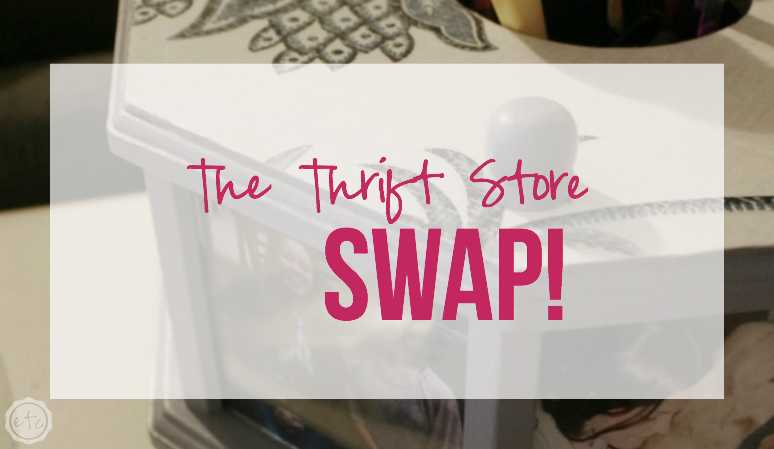 The THE THRIFT STORE SWAP is finally here! I know you’ve waited patiently… so let’s get started shall we? This swap was soooo much fun! 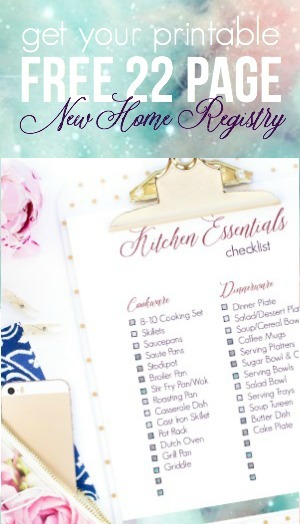 I love re-purposing things and making them pretty again… so this swap was right up my ally. But can I tell you a secret? Shhh… don’t tell anybody! That’s right, I was totally freaked out. I thought “what if someone sends me something and I don’t know what to do with it? !” When I work on projects by myself it’s easy… I come up with the inspiration and I work on what speaks to me. Now I have to work on something that speaks to someone else! Eeek! We played a game of round robin to see who would send to who… and decided that I would send an item to Carolyn of CC McAfee Perspective… while the fabulous Tracy from At Home with Sweet T would be sending me a little something something. You guessed it… I had no idea what to do! I stared at it for a while… Talked to my hubby about it (he thought I should make it into a projector for spinning pictures which was a crazy cool idea but waaaay too complicated! )… Then I placed it in the middle of my living room floor and stared at it as I walked by for a week. I moved it to my mom’s house for a week and finally lugged it out to my new house… where I still had absolutely no idea what to do with it. I decided I would have to paint it… there was no way the yucky wood would be salvaged… but what could I do to the top that was new and exciting? I thought about adding a decal and researched several french antique graphics… I even took a poll asking for your votes (and had a lot of great responses!) I thought I finally had a great idea but when I printed out the graphics NOTHING seemed to fit! 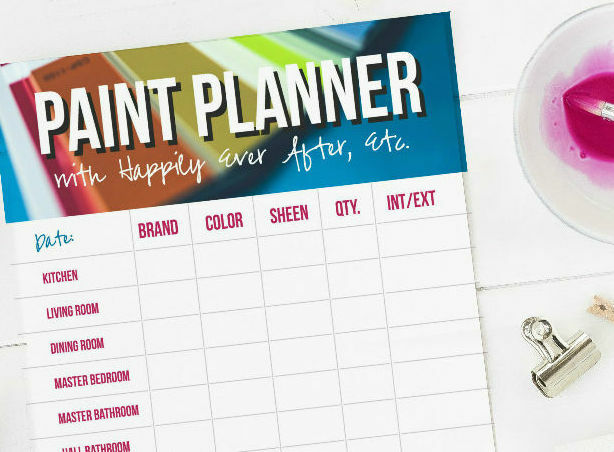 I looked through the wallpaper books and found a pattern that matched my Sherwin-Williams Bracing Blue paint color perfectly… and then it was off to the races! 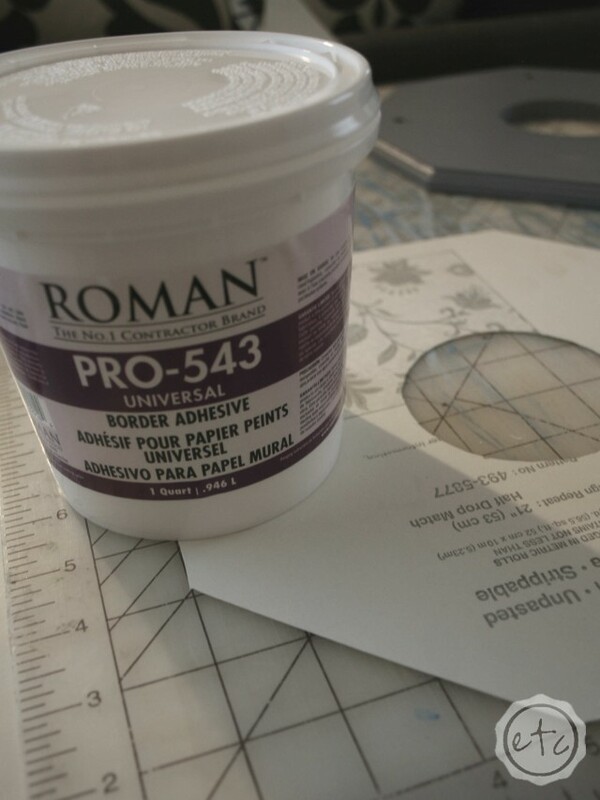 I attached my wallpaper sample with a bit of border adhesive (don’t worry I’ll walk you through that in a separate post!) and the angels started singing! I can’t BELIEVE how much I love the end result! After the paint had dried and the wallpaper was glued the final step was adding pictures. I originally wanted to add wedding pictures (of course!) but I could not find my printed wedding pictures anywhere!!! What I did find was a mixture of college photos, ski trip memories, a day at the beach from spring break and a sleepover with my best friend from high school. While the wedding pictures would have been gorgeous it was kind of the expected response… I feel like newlyweds use wedding pictures for everything. Don’t get me wrong I LOVE my wedding pictures but it was nice to take a break from the wedding and use memories. I love looking at all the good times! Go on… take a look for yourself! If you loved the swap as much as I did I’m sure you’re wondering what the other ladies have come up with! 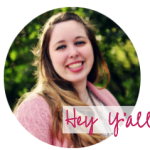 Check out what Carolyn of CC McAfee Perspective did with the items I sent her… or go backwards and see what Tracy from At Home with Sweet T received! I know Tracy was having a hard time coming up with ideas as well… I can’t wait to see what she ended up with! What do y’all think?! Do you love the wallpaper as much as I do? What would you have done with my round-about thingy?! Ready for a little more Swap?? I LOVE what you did with the little round about! Worth the wait for sure! I’m so glad it was worth the wait! Haha! 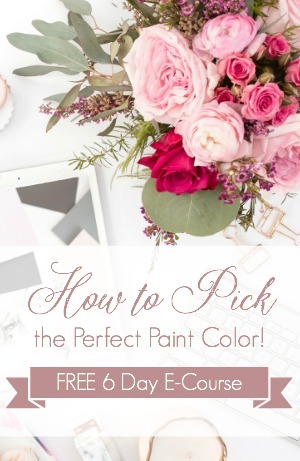 I was so excited to see what the other gals came up with… The suspense was killing me! Thanks for stopping by Carolyn! I still have no idea what the round-about thingy is, but you are so imaginative and you made it into something beautiful. I love the wallpaper btw! Thanks Lyn! I really have NO idea what it is either… I know turnstiles were big in the 60s and 70s but they were typically for napkins, salt and pepper… Kitchen table stuff. This is not the same thing! Haha! Oh well I love how it turned out! I love thrifting! I am actually about to do a post about it! Sounds like fun Alex! Thrifting is so much fun… You never know what you’re going to find! Love what you did with it! Such a great way to display photos in your home! Isn’t that a nice touch! I love being able to spin it and see all the fun pictures! Betsy, this is so precious!!! A little imagination goes a long way!! What else can I say, that you took what looked like nothing and turned it into a jem… sho uld I keep going? The color is great, the idea of the photos is brilliant! You’re making me blush!! You are so sweet! I’m so glad you like it, I am so pleased with how it turned out! Thanks for stopping by Mary! Betsy, you did an amazing job with your thrift store swap! 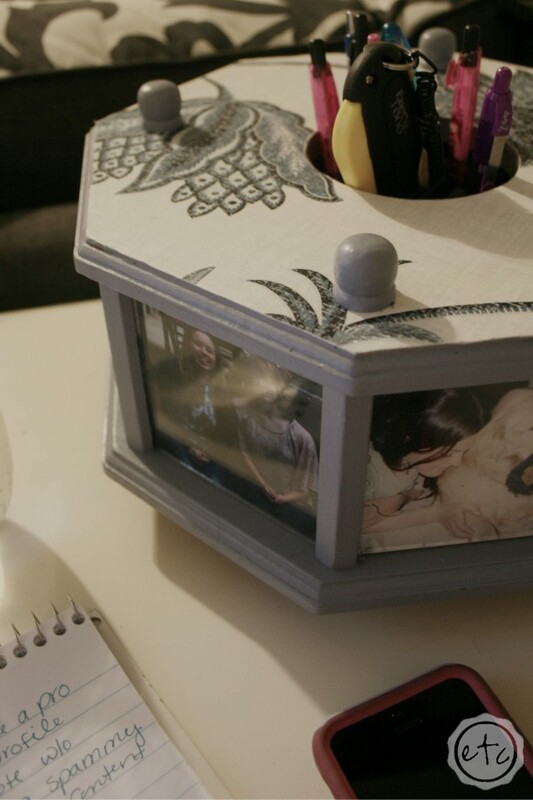 I love that you made it not only a picture carousel but it works great as a pen/pencil/marker holder too! Lovely piece for a desk top. You definitely worked your magic on this piece! Can’t wait to see what you do for the next swap! Thanks Lisa! You ladies are so sweet! I love how it turned out… Even the hubby stopped in his tracks when he saw it and was like “that is not what I was expecting… It turned out great!” Can’t wait for the next one! Love the idea and how it serves multiple purposes. 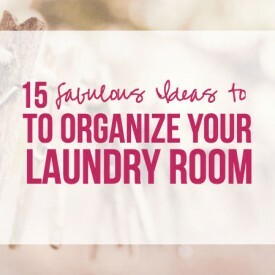 Makes me think that if I do allow new/repurposed pieces into our home they should be multi-functional! Definitely! The best pieces always do multiple things! Thanks for stopping by! I love this idea! You are so clever! My pens are currently taking up space in a drawer. I’d love to do something fun like this! You are very creative! 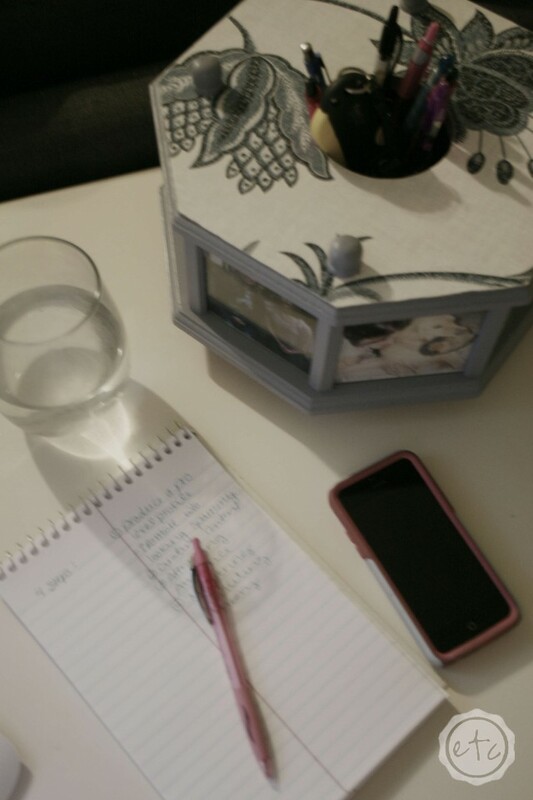 I love having mine out and easily accessible… But I’m kind of weird about my pens! I love different colors and use them for crafting and journaling so I always have a lot! What a fun way to show photos! It turned out so cute. Thanks Julie! I love to display pictures everywhere… So this turned out great! This turned out so cute! 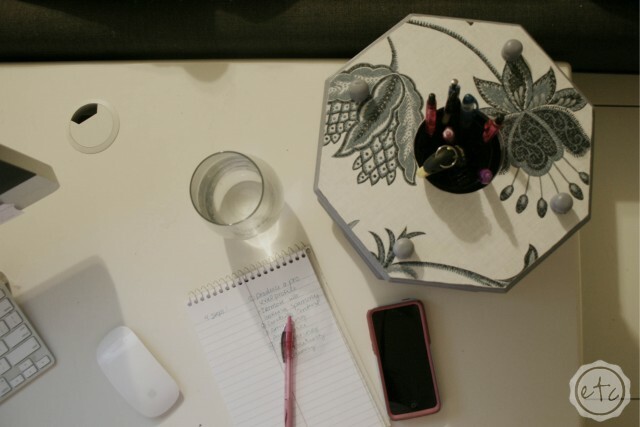 I’ve never seen a “roundabout thingy” before, but I love that it does double-duty as a pen holder and photo display! Haha!! I’ve never seen one of these before either… Hence the highly original name! Maybe one day I will learn what it’s called but since Google didn’t know I’m not sure anyone does 😉 either way I love how it turned out! Thanks for stopping by! Oh my goodness. This is fabulous. I love love love what you did. I am so awful about starting projects but not finishing them (insert my husband who will reluctantly finish things). This looks like a wonderful swap but I just don’t know that I would ever find inspiration! That’s the challenging part… Figuring out what to do with something someone else sent you! Haha! Luckily it tinted out great… I can’t wait for the next one! OMG what an amazing job on that find! I would have never been able to pull this off. Such a sweet way to display your pics. Thank you! I love being able to see my friends and family as I work! You’re so sweet! I love the color you painted it! Looks great! Isn’t it pretty? 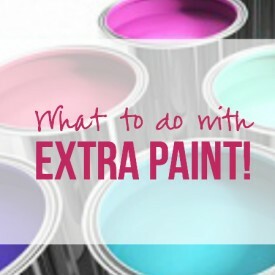 Working at Sherwin Williams I am always seeing new colors I just have to try… I knew bracing blue would be pretty I just had to find a project for it! Thanks Steph! I love thrifting for that exact reason… You never know what you’re going to find! That is so cute. Seems wallpaper is back in vogue everywhere! It was the perfect solution for my little round-about! Haha! The sample was the perfect size and free!! Oh my, that is genius! Nicely done. I’m also a Michigander (formerly north and now western). I love this idea of swapping items and using your ingenuity to create something! I’d love to join in something like this. Thanks for stopping by Melanie! The swap was definitely fun… We are going to do another one soon so maybe you can join! Can’t wait to see how it goes! This looks so great!! I love what you did with it! What a fun project! Thanks Meg! I’m tickled that you like it! This is such an awesome idea for a swap, and wow! You did an awesome job! Thanks Tatum! I was thrilled with how it turned out… I’m so glad you liked it! 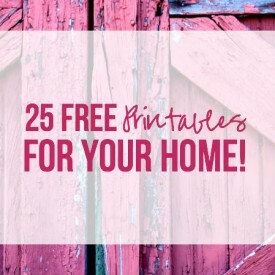 Love projects like these especially when they’re so affordable! Affordable is definitely important! 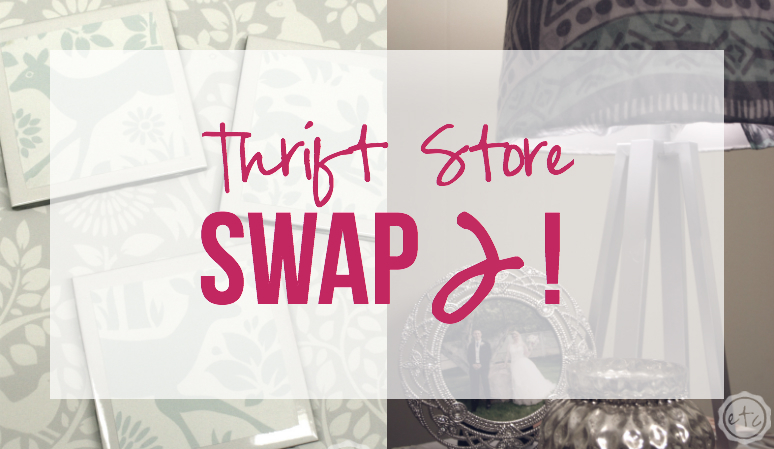 That’s what I love about our swap… It’s $10! WOW!! This is totally impressive and I never would have thought to do what you did!! I love thrift store shopping and refurbishing things so this was totally up my alley! 🙂 I shared earlier this summer on my blog about a “porch redo” that my mom and I did with a set of thrifted chairs 🙂 (http://www.caravansonnet.com/2015/06/camp-porch-chairs-for-our-1901-cabin.html) and you have definitely inspired to keep searching for buried treasure! Thanks so much for sharing!! Stopping by from the Blogelina Commentathon and so glad that you are in my group! I love how your porch turned out… so cute! It’s so much fun to meet other gals who love to thrift and re-purpose as much as I do! Thanks for stopping by and for your sweet words. I love meeting all the gals from the commentathon! Wow, I like it! That turned out really cool! You’re so sweet Rachel, Thanks for stopping by! Wow! That turned out really cute! I’m the worst at anything DIY or crafty or repurpose-y so I think your idea was brilliant! Sounds like a cool exchange for everyone involved! The swap is always a fun exchange.. I love working with the other gals on it! Thanks for stopping by Allison! Doover things… I like it! You’re so sweet Andi, Thanks for stopping by! This is amazing! You definitely transformed this thingy into something lovely! I just wish I knew what it was! Thanks for stopping by Deanna! I love the idea of trading thrift store items for reuse. At first I thought this was an end table in the before pictures because I couldn’t really tell the size. 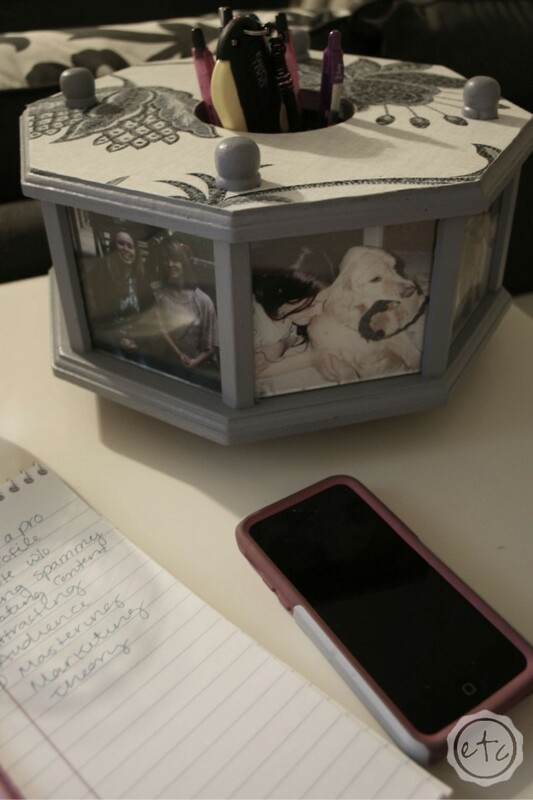 I like the way you made it into a pen holder as well as a picture carousel. It’s definitely hard to figure out what it is at first… it’s such a weird little item! That’s the fun of the swap though… you never know what you’re going to get!! Thanks for stopping by Riva! Wow! You did a beautiful job on your piece! I’ve thought about joining one of these too, but like you I’d wonder if I would like to piece sent to me and what I would come up with. I bet you are glad you stepped out and did it! You are very creative – kudos to you! I finally just had to take the leap and hope I’d figure it out! Luckily you have about a month to work on your item… so that’s plenty of time to figure it out! Haha! Thanks for stopping by Val! What a clever and creative idea! Great way to repurpose something. You’re such a sweetheart! Thanks for stopping by Teresa! I love what you did to your round-about thingy! I remember my mom having something very similar when I was a child. She had flowers in the middle and pictures of us all the way around. Seeing yours brought back those sweet memories 🙂 I really like the way you have your blog set up too! Great Job! Wow, that’s the first time I’ve heard someone say they recognize this little thingy-ma-jig… I’m so glad it brought back sweet memories for you! 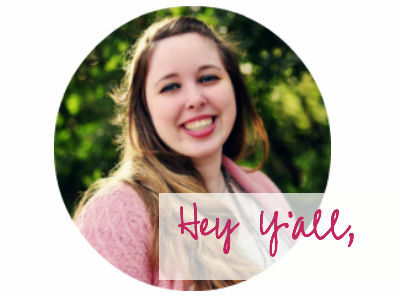 I’m also really glad you like the blog set up… I’ve really been working on it lately! Thanks for stopping by Renee! I’m not really sure what I would have done with the object you got, but love what YOU did with it. I’m not much of a DIYer, so I would have been pretty stumped myself. Trust me, this gal was definitely stumped on this one! Luckily I finally figured it out! Thanks for stopping by Sandy! Ah! I love it!! This is great. You are so crafty, I never would have thought of doing that! You’re so sweet… thanks for stopping by Aly! Wow, I’m amazed at your creativity! I buy clothing at thrift stores but don’t usually look for other things. There’s a whole other world beyond the clothes rack! Sometimes it’s full of junk but sometimes you find a diamond in the ruff! Thanks for stopping by Beth! What a great idea! I love what you did with your thrift store find! I enjoy arts & crafts, but I’m not a great DIY kind of gal–though I wish I was! Sometimes it just takes a little bit of time to figure it out… but the world takes all kinds! Thanks for stopping by Wendy! Super creative! I love that you had this $10 challenge. Easy, fun & so personable! 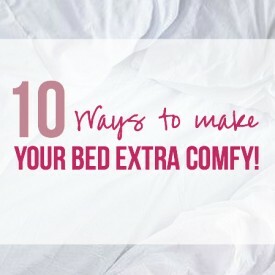 The $10 was the best part… things don’t have to break the bank to be awesome! Thanks for stopping by! What a great idea. I love going to thrift stores. You have talent and very creative. You’re so sweet, thanks for stopping by Mary! What a wonderful result! Actually, know what something once was can inhibit ideas for what it can be! I love that you create with such beautiful abandon. Thank you for sharing! That’s a great point… if you don’t know what something was meant for you can come up with a completely unique use for it! Thanks for stopping by Jeanie! Great idea! That is definitely challenging the DIY in me. Looks great! I’m glad you love it! Thanks for stopping by Jeremy! What a really cool idea, I wish I was creative like that but I’m not. How often do you do these swaps? The swaps are so much fun!! It’s fun to figure out how to make-over such weird items!! We do four swaps a year… each one about 3 months apart! Oh…I love, love, love what you did with the round thing!!! I never would have come up with that idea myself, but you surely re-purposed the item into a one-of-a kind beauty!!! You’re making me blush… thanks for the sweet comments Georgia! Thrifting is the best way to find the most unique things and then you use them to become crafty! I love it! 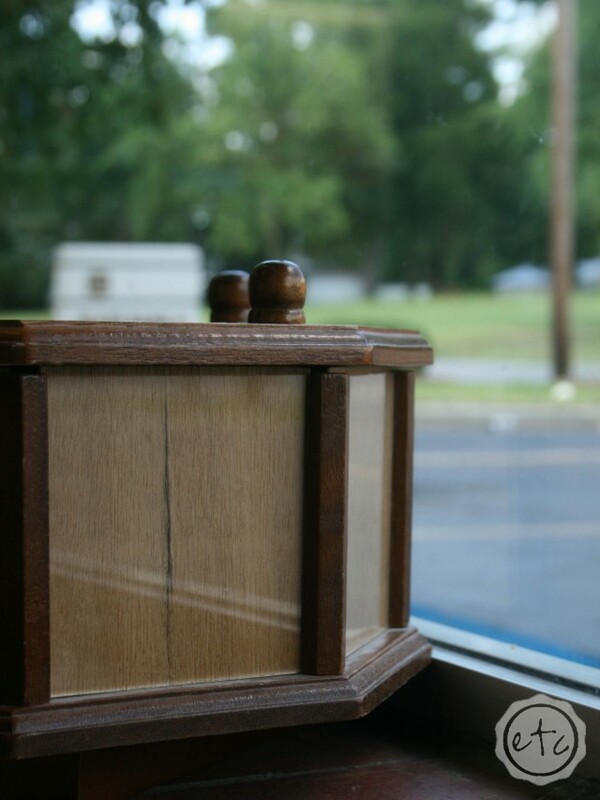 Such a great perspective… you really do find the most unique things when you’re thrifting! Thanks for stopping by Michanda! Oh my gosh, I love the end result! I am creative, but I don’t know if I would have been able to come up with something this adorable! This is such a fun idea, and I’m excited to check out what the others came up with for their projects! The best part of the swap is checking out all the projects… have fun on your rounds! Thanks for stopping by! You did a wonderful transformation of the round thingy. I like how you personalized it and used wallpaper you had on hand. Great job! Thanks for the sweet words Erlene, I love how it turned out! 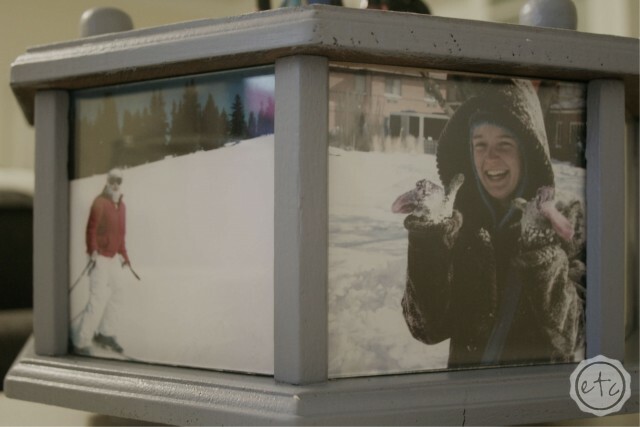 Especially the pictures… I love seeing my friends and family each time I go for a pencil! Even more, I love the story of your adventure. What fun! And what a fun memory each time you look at it and use it! That’s ok Anne-Marie… I still have no idea what it is either! Either way I still like how it turned out! Thanks for stopping by… and for the sweet words! Wow! I LOVE what you did with it! Kudos for not giving up and coming up with something super cute and creative! This one definitely took a little perseverance!! I’m so glad it worked out! Thanks for stopping by Alexandrea! I absolutely love thrift store shopping too. I am so impressed with what you did with this project. I was really curious what you would do with it, but I love how you put photos and changed the colors! Beautiful! If you were curious as to what I’d do with it… I was twice as curious!! 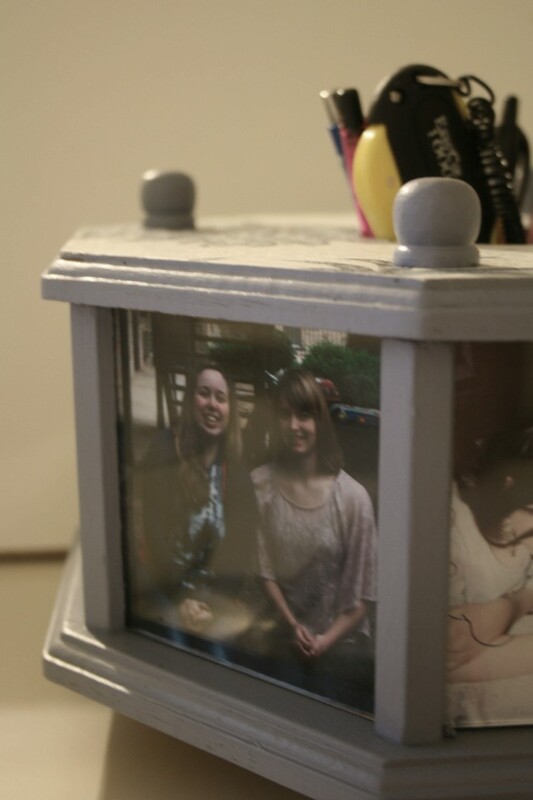 I love having the photos on my desk every day… I think it turned out great! Thanks for stopping by Autumn!! I love what you did with it! That’s so beautiful, let alone creative. You’re making me blush!! I’m so glad you like it! You’re so sweet Robin, Thanks for stopping by! You’re so sweet Cindy, Thanks for stopping by! I think the wallpaper idea definitely worked out. You are quite creative! I am terrible with coming up with ideas like this. I’m so glad you liked the wallpaper… it was so hard thinking of a great idea! Once you come up with one it hits you like a ton of bricks! Thanks for stopping by Shani!! wow! the roundabout way worked so well and I am glad it did. The was really a clever way of doing things. Its a first and from now on, we shall call it “Betsarized Thrifting”. Thanks Brian! 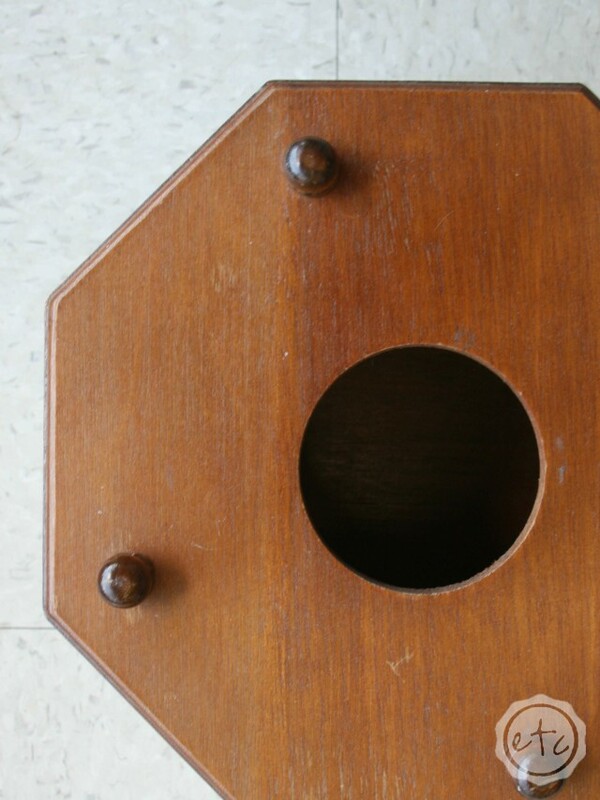 “Betsarized Thrifting” is my new favorite term… I think I’ll have to use it on the blog! Thanks for stopping by! Loved your post for the commentathon… Christian Grey’s reviews on amazon? Hilarious! Such a fun event and such a great project! It looks great! Thanks for the inspiration! I’m so glad you like the project… it was so much fun! Thanks for stopping by Amy and for your sweet words! Ok so that was soooo cool and seems really fun! You absolutely made it gorgeous! You’re awesome! You’re making me blush… thanks so much for the sweet comment! LOVE how it turned out! It’s a great way to display pictures and be useful at the same time! Form and function is the best… thanks for stopping by Nicole! I love the wallpaper and what a cute way to display photos! My Dad has the vintage photo cubes that belonged to his parents. Everybody loves flipping those cubes to show different pictures when they visit. 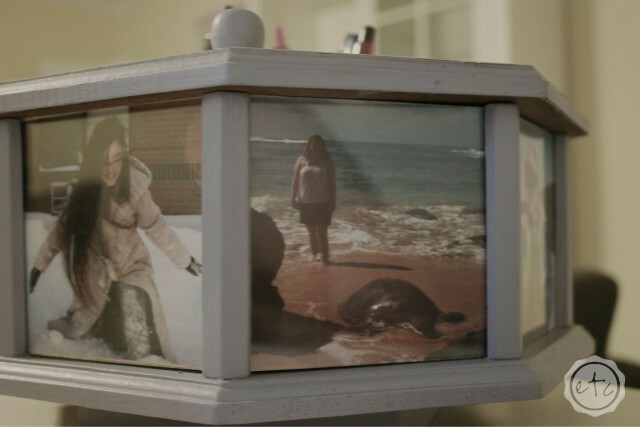 My Dad has photo cubes like that too… I can remember looking through the photos as a little girl! Thanks for stopping by Lori! What a cool idea! You did a great job with the pics! I am inspired! Thanks for sharing! You’re so sweet, thanks for stopping by Kelly!! I love how the pictures turned out! I don’t have a crafty bone in my body, but I can enjoy what others do. I LOVE what you did with that! Wow you did a great job! It was neat to see what you changed it into. It is beautiful! I love this idea! It’s so cute! That would be perfect for my desk! What a cool idea! 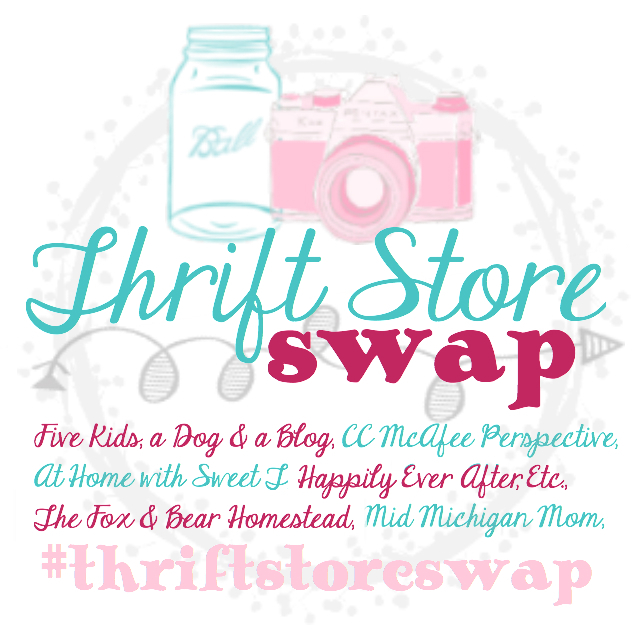 I’ve never heard of a “thrift store swap”, but how fun is that? You did a great job! Wow! This is so cute! My mom actually had one of these when I was little…just an old brown one. I always thought it was kinda neat, but I love what you’ve done with it. I love thrift store shopping, and recreating. My family gets a little tired of all the things I bring home to repurpose, but most of the time, they love what I recreate for them. Thanks for the share, and all the other items were really cute, too! I love when I see up-cycle items and the blog about it. I’m a big fan of the Thrift store. I frequent them here in London, Ontario. Lovely project! I would still be staring at it trying to figure out what to do! Trust me… I stared at it for several weeks! Thank goodness inspiration finally kicked in! Thanks for stopping by Nancy! I love what you did with it! Very cute and a great new storage solution for your desk.